Your camera has a rangefinder that helps you focus the camera. 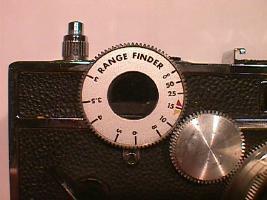 On all models except the C, there is a gear that couples the rangefinder to the lens, so that using the rangefinder automatically focuses the lens. To focus the camera, look through the righthand eyepiece on the back of the camera. Turn the rangefinder dial back and forth as you look at the subject you want to take a picture of. You should see two images of the subject, one that may be tinted blue or yellow, that move apart and come together as you turn the dial. When you turn the dial so that the two images come together, the camera is focused on the subject. You can also focus the camera by simply setting the scale on the rangefinder dial to the distance to your subject if you know it. Also, if there is enough light to use an aperture of f:11 or f:16, you can simply set the distance to 15' and everything from about 8' to infinity will be in sharp focus. On the model C, that doesn't have the coupling gear, use the rangefinder to find the distance, look at the distance on the rangefinder dial and set the lens to the same distance marked on the barrel of the lens.